Black crows. Commonly and usually associated as rats with wings. Picking up the leftovers, hassling over every last crumb of a granola bar at the beach, or a lost bite of a gyro sun dried with the hustle of an overpowering city. Give the definition some slack, as that is just one girls wild interpretation of such creatures. Though, the black crows I am referring to are quite the contrary. They are the eyes of the valley. Why yes, they often snaggle around for the last bite of baguette atop Brévent, or at the mid station in Grand Montets. But when the black crows are out, so are the blue bird skies, and the free bird souls. Perhaps we are all the same as the black crows - analyzing the weather, scavenging the mountain for what it is worth; Rinsing every fresh line dry until the storms come again, and sharing stories at the local watering hole. It is quite difficult to compare Chamonix to the other ski resorts of the world. There are no covered or heated chair lifts for miles, ski in ski outs are for the extremists, and how does one even determine what après ski bar to go to? Would you walk into Elevation in your moon boots and Bogner jacket? You could, but Probably wouldn’t. The latest season's Patagonia only, S'il vous plaît. Just as a background story I skied Chamonix for the first time 4 years ago with my mother - the peaks alone got me hooked. I didn’t even explore past the McDonalds on Avenue Michel Croz because I didn't even think anything worth going to was past this way (I just to happen to miss all of the best après ski bars) Eh. You live and learn, right? One year later I found myself getting dropped off by some handsome british transfer driver asking me “Is this your address?” My response: “Eh. I am not exactly sure… this is what they gave me? I guess I will find out” I went to ‘study french’ in a town that echoes swedish and english over a lick of anything french. Although, Insted the school I studied at was phenomenal. Skiing and Studying - genius beyond the SEO search value. In the two months spent there I learned how to drink a lot of beer, eat even more baguettes, say cheers in swedish, and attempt to keep up with the ski bums. The following year, same time, same place - I arrived fairly more confident of my location for an ‘internship’ with a startup (talk about a resume builder) and while the season started out slow, I made some friends, drank more beer, and learned what the mountains had to offer. Patience. This year, I booked a 4 day stay in the city that stole my heart - and it is safe to say nothing has changed. The swedish ski bums still affluently populate the city / bar / restaurant scene, the snow was dumping, and the black crows are still flying high. Touche chamonix, touche. I personally always forget to use the extraordinary guides of the internet (lonely planet, checkin, tripadvisor, pinterest, etc.) I usually prefer to ask my friends where to go when traveling. So if you are also one of those people who are horrific travel planners - as in aimlessly wandering in a city until you see a menu with a typeface you like, and a crowd that looks enthused this one is for you. Venture to Chambre Neuf around 6:15 (when the ski bums arrive) for No Limits live band (expect to scream 'one more song' , 'we are Chamonix', etc. - the swedish and norwegian ski bums dance on the tables, feel free to join, they won't bite - crowd surfing is allowed, hang the pitchers on the chandelier when you’re done). *Don't shower beforehand, and wear your ski clothes. Moo Bar - Pulled pork burger. Just do it. If you want to buy food their are plenty of grocery stores (Petit Casio) scattered around town (next to the Rossignol store, and across from WESC) and Super U located across from Moncler -ish. The beer is on the first floor, and the food is cheaper than the other places.
. I like the little places like Hotel du Louvre, and Hotel Richemond. Partly because they are near the bars, restaurants, and busses to all of the ski lifts (call me lazy). Wifi is fast, cheap and the breakfast and coffee is sufficient (Croissants, Pain au chocolate, and hard boiled eggs). There are plenty of beautiful places to stay throughout the city. 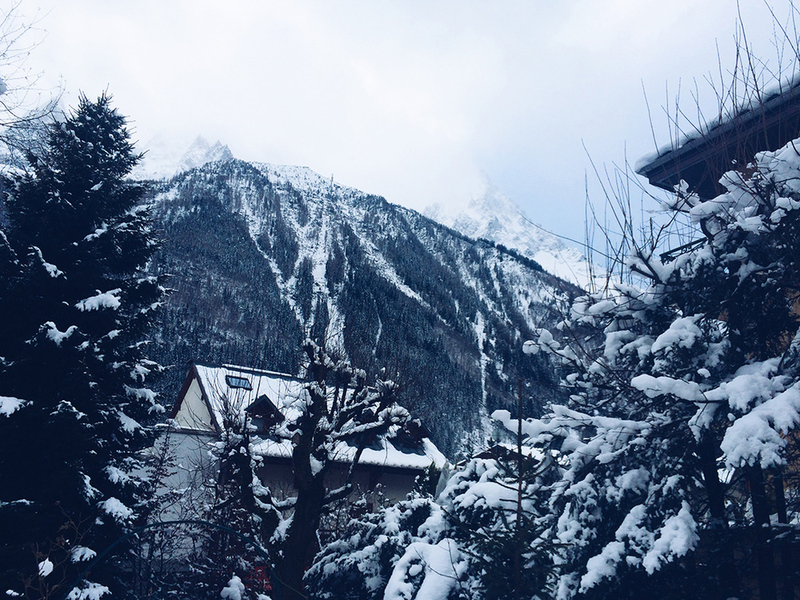 Until next time, Chamonix. For those who are there - enjoy it. My nano retreat experience at the J Hotel outside of Stockholm hosted by Stina, a day focused on disconnecting & reconnecting with oneself. Summer sailing in Svalbard on-board Duen III with Pukka Travels. Glaciers, Old mining towns, wildlife in one of the most northern destinations to travel to on planet Earth. Winter may have been long, dark and cold but it sure was easier when spending time with incredible people from all over the world. This is The Pukka Philosophy. A review of the Kimpton Carlyle Dupont Circle Property in Washington D.C. An incredible location, friendly staff & top of the line amenities. A 72 hour post-Galapagos retreat to the Chilcabamba Mountain Lodge in the Highlands of the Ecuadorean Andes. Fast wifi, horseriding & views for days. When a little goes a long way. A little explanation about why Pukka Travels did an ocean clean up in Tromsø where the whales feed in the winter. A 48 hour RV trip through Lofoten, Norway. A magical place with sky high mountains, secluded bays & an infinate amount of places to explore.